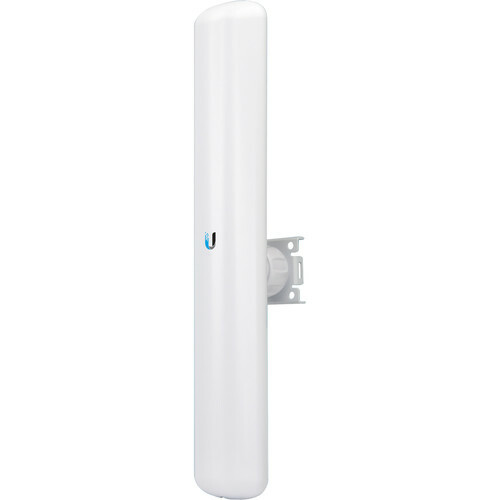 Ideal for the deployment of long-distance outdoor broadband, the LiteAP ac Access Point from Ubiquity is a lightweight, pole-mountable access point that operates in the 5 GHz frequency band. Capable of long-distance wireless links in excess of 19 miles, the 16 dBi LiteAP ac employs Ubiquity's AirMAX TDMA protocol to boost performance and throughput, as well as to reduce latency. Equipped with a 10/100/1000 Mb/s Ethernet port, the 14.8-ounce access point comes with a pole-mounting kit and can be installed by hand. After initial setup over a web browser, the LiteAP ac can be configured using the UNMS (Ubiquity Network Management System) app for iOS and Android. Capable of high-speed links exceeding 19 miles. The LiteAP ac features a unique ball-joint mount that provides adjustment flexibility along three axes for versatile mounting options. The mounting system, coupled with the built-in bubble level, enables quick and easy alignment. Connect the ball-joint mount to the LiteAP ac by turning the lock nut clockwise by hand. The UNMS app provides instant accessibility to the airOS configuration interface and can be downloaded from the App Store (iOS) or Google Play (Android). UNMS allows you to configure and manage the LiteAP ac and offers various configuration options once you're connected or logged in. Box Dimensions (LxWxH) 18.9 x 4.0 x 3.2"